tweet tweet! is this thing on? I tweet. If you don’t–or don’t want to–you might could use to stop reading at this point. (oh stop. I don’t talk like that, I just WRITE like that. sometimes. It’s my husband’s fault. He’s from the land of “might-could”, you know.). I tweet less now than I used to, but I still tweet. There is SO MUCH to take in on Twitter. I use TweetDeck–anybody else? And I use the columns function to follow some pretty important topics (to me). 3. #Coyotes. Because I am an ardent follower of my hometown hockey team. They rock my casbah. 5. #RedWings Because I really REALLY like the watching the Detroit Red Wings but nobody has to know because my TweetDeck columns are not publicized. What? Now wait a minute… No! NO! YOU show me another team with The Perfect Human at the helm and THEN we can argue this one!! 6. Gene Therapy. Because there are so many clinical trials featuring gene therapy. I have so many loved ones dealing with Parkinson’s, diabetes, and muscular dystrophy that following this hashtag has proven valuable over and over again. Gene therapy is where it’s at, folks. 7. #stemcell. Amazing work being done in regards to stem cell research and therapy. Even if the work won’t save my own kids, the science is still amazeballs. I’m hooked. 8. #meatlessmonday Because yesterday was Monday. Also I don’t eat meat. Also I need meatless recipes. A girl’s gotta eat, you know. 10. #raredisease Because it’s wonderful to see what research and fundraisers are happening in the broad community of rare diseases. 11. #specialneeds Because it’s amazing to connect with other tweeters and bloggers who are raising non-typical children, if you’re a parent of a non-typical child. 12. #blogher11 Because I’m going. Are you? Please say yes. I want to meet as many people there as I can! My TweetDeck might very well be the hardest working of all my technologies. What say YOU, dear readers? 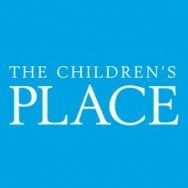 Join us for the Facebook Fiesta live chat hosted on The Children’s Place Facebook page where our celebrity mom and blogging mama co-hosts will chat with fans in an open forum about all things fashion, family and fun in the summer months. Please pass this invitation on to your friends and family so that they can be a part of the celebration, too! I look forward to seeing you chatting tomorrow night! See you there! Took Them Out to the Ball Game! I took the children to a Major League Baseball game over the weekend. It was the realization of a dream I’ve long had–my children watching our hometown team kick some Los Angeles culo in person. How sweet it is! Did I say sweet? I meant sweaty. And labor intensive. It all started four minutes into the thirty minute drive to the ballpark. Four year old boy twin Kyle fell asleep–hours before his usual nap time. The girls fought in the van the whole way there. We finally arrived to the ballpark district and found that one hour before game time is decidedly not early enough for a family with kids and wheelchairs. But we pressed on. We navigated our way from the parking lot to the ballpark–that is, until Kyle’s power wheelchair inexplicably and abruptly came to a halt. In a surging crowd of a hundred baseball fans. On railroad tracks. To the public’s credit, two families stopped and offered to help us–but since none of them seemed to be technical experts on Permobil products, all they could do was keep the crowd flowing around each side of us and make sure my girls didn’t wander off. Eh, it’s okay–I’ve faced more frustrating circumstances in my life. This is simply a wheelchair that won’t move forward. I got this! I disengaged the electric so that I could simply push it off the railroad tracks and off to the side until I could troubleshoot the cryptic error message flashing on his display. Except it turns out that my six minutes a day Shake Weight routine may NOT be working because I lacked the upper body strength to manually push this 350lb chair over railroad tracks in a crowd of dozens of people in extreme heat. Eventually we made safely it to our outfield seats. 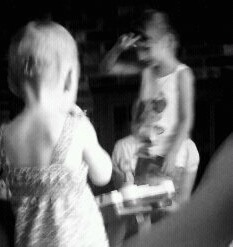 I eventually got the girls settled with popcorn and cotton candy and then. And THEN. I snuggled next to my boy, and we watched some baseball. I helped fit his glove onto his hand when our team was on the field. I helped position his little bat when our team was batting. I taught him the chants. He learned the clapping rhythms. I think the girls noticed that there was a ball game (sometimes they cheered and clapped), but for the most part they fought over cotton candy and told terrible knock-knock jokes to each other. Kyle called foul balls and “stee-rike three, you’re out!”. We even witnessed a home run. Eventually I gave in and agreed to buy the girls popcorn, only for them to break down into hysterical tears when the vendor didn’t notice our money in the air and he walked away (he came back later). But Kyle, that kid was too excited to watch a ball game to eat. No chance he was going to put down his bat or glove in order to put food into his mouth. Kyle–“The batting. And the pitching.” Aww! Jenna–“I don’t have a favorite part because I didn’t even want to go but you made me.” Hmm. Our experience at the ball game served as such an expression of my kids’ differences. The boy loves sports and loves baseball and is the purest type of fan. His twin sister was just along for the ride–and the sugar. And his big sister would rather have been home watching Wizards of Waverly Place reruns. My family–perpetuating gender stereotypes since 2004! Hi Friends! (Both local and national) It’s National Ice Cream month and I have a few different things going on in the next couple of weeks. BUT… today… it’s all about Cold Stone Creamery! You want some now… don’t you? 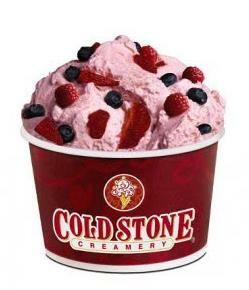 I’m so pleased to have Cold Stone Creamery as a sponsor of July’s sold out AZ Mom’s Night Out. If you didn’t get in on the fun… don’t worry! There are events coming up almost monthly! Stay tuned HERE or at Scottsdale Moms Blog to hear the latest AZ Mom’s Night Out News! And now… to WIN! I’m giving away a $25 gift card to Cold Stone Creamery along with my partners, Scottsdale Moms Blog! So enter here… enter there… Play along and win some summertime goodness from Cold Stone Creamery! *Leave a comment below sharing your favorite ice cream memory. The winner will be chosen at random on Friday, July 22! I’ve never been so flattered… really. I’m completely humbled by a video that’s come out about me from IFV News. I did a simple interview in New York City at an event not too long ago and it’s turned into this completely amazing video that displays my career from start to now. One new addition… In the video I talk about monetizing the blog without ad space, by doing paid posts and such. However, I do currently have 2 very special ads on my blog in support of the monthly events I’ve been hosting with Scottsdale Moms Blog. Without community supporters like Cold Stone Creamery and giggle… these events would be very difficult to put on. Attendees don’t pay a dime to enjoy Mom’s Night Out. So thank you… sponsors, community, and IFV for supporting me as move on to make a difference in the social space. As I am a slave to my efforts in making my wife happy, I agreed to take our annual 4th of July trip to her parent’s house in Western Pennsylvania again this year. I say “agreed” in that there really wasn’t any choice, and even if inside I knew it was going to be a chaos and scream filled trip, testing our sanity and pushing the boundaries of our breaking point, I was going and there was no way around it. The reality of it, the ugly truth about these trips, is that beyond the sweeter parts of spending time with family and friends we love is that, although it’s only a week long in actual travel time, it really turns out to be a lot longer at the end of it all. What the fictitious “Visiting the In-Laws” travel-brochures (which I’m, of course, making up for dramatic purposes) don’t tell you, is that your trip will be three weeks long, give or take. It turns out that the week or so preceding the actual departure day, the stress of preparing for and knowing what you’re about to embark on this exercise in chaos…it all begins to build, in ways similar to how you might find anxiety building in the week leading up to an appointment with your dentist for root canal work done in a week is stressful before hand…then comes the root canal (or, in this case, the 4+ hour long flight with two lap-children and a 5yr old who has some substantial skill at playing the Wild Card in such circumstances) … and more root canal (spending a week out of our natural organized and controlled habitat, but rather in one of the most non-childproofed and family-filled houses in the Eastern United States…all with two, now incredibly more mobile, frighteningly curious and wildly mischievous 22 month olds ). Did I mention that there was no anesthesia? Oh…yeah…that part. I’ve painted a pretty picture, haven’t I? It makes you want to pack-up and take a cross-country trip with your own midgets, just to see what it’s like for yourself, right? Well, I will admit that amongst all the crazy and, forgive me for saying it again, screaming (because there was a lot of screaming on this trip.) I will also admit that being in these environments that were new to us, and often times filled with hazard, requiring constant attention be paid to their every move, really made their individual personalities come to the fore: The Social Butterfly was more obviously butter flying around than normal; the Super Cautious one was exactly that, watching her sisters be crazy all over the place from a safe distance; and the Daredevil one dare-deviled it so much that I suspect she set new records for the number of bloody-noses, fat lips and face-plants one 22 month old little girl has ever given themselves. The injuries aside, it was really fun to watch them explore this new world, and to watch them grow. It’s amazing how quickly they emulate other kids that they encounter along the way too… as a matter of fact, this, the 3rd week of our trip, the back-at-home-deprogramming portion of the trip, we’ve been focusing on breaking them from new habits that they formed during their crazy week in Pennsylvania. …And tonight there was talk about planning our next trip back East around Christmas. How much damage can these girls do in the snow, I wonder. So…How’s your Summer going so far?